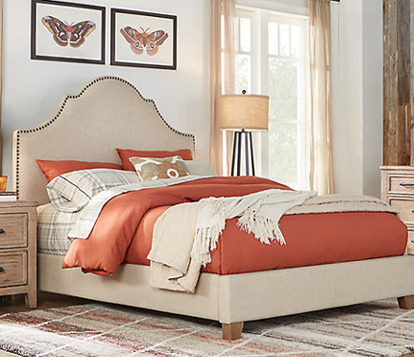 The key to a dreamy bedroom is finding the perfect bed. Whether you prefer your bed to make a grand statement or set a tone of understated calm, there are many styles to choose from. This comprehensive list highlights popular types of beds with a brief description of each. 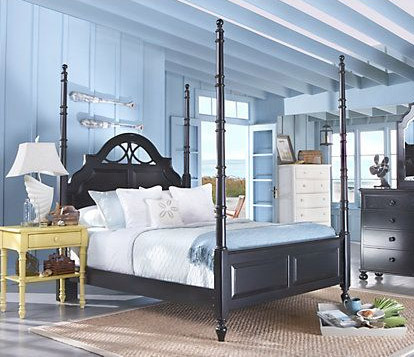 Canopy beds make a grand statement in a room. Also known as tester beds, they have posts from each of the four corners that are connected by canopy or tester, either in framework, fabric or ceiling format. Though many people automatically think of fabric with a canopy bed, not all canopy beds have draped fabric. 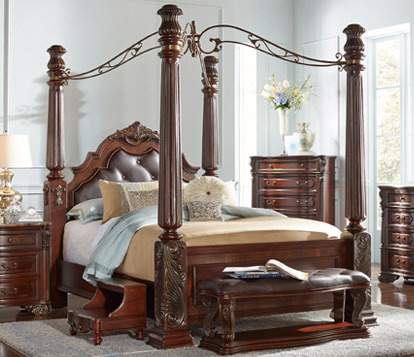 Traditional canopy beds typically have ornate carving details, decorative finials as endcaps on the posts and possibly a romantic, Victorian influence. 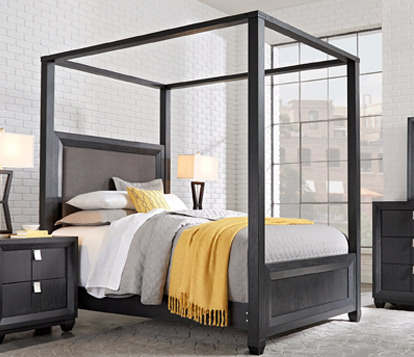 Contemporary and modern canopy beds are more streamlined, have bold or architectural lines and minimal to no embellishment. 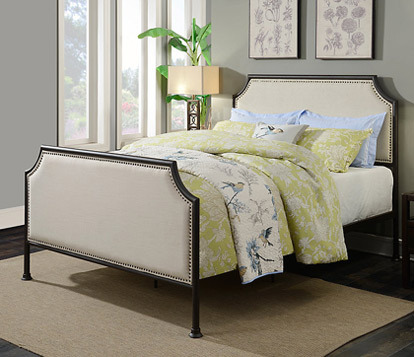 A panel bed has a tall headboard and/or footboard decorated with panel detailing. Often the panels are created with sections of moulding, shuttered insets, raised wood panel or upholstered insets. 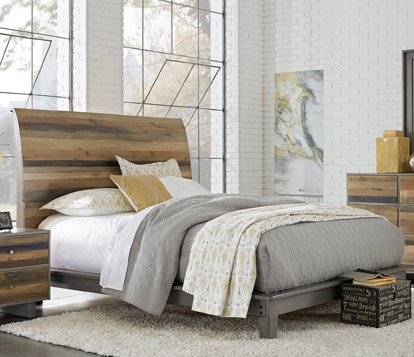 These beds add dimension and interest to your room, often with different textures or finishes applied to the panels. A poster bed, also called four-poster bed has columns on each of its four corners. 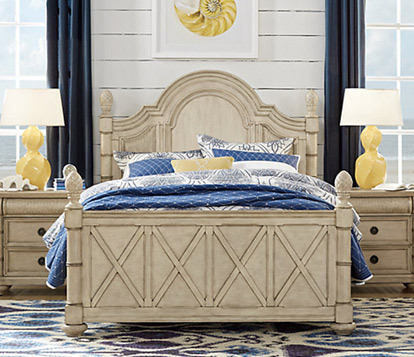 These vertical elements can be quite grand or just a slight rise above the headboard and footboards. Originally these were tall columns used to support fabric hangings that would insulate sleepers from night time drafts, but today the corner posts vary in height and sometimes consist of not much more than a decorative finial for low post beds. Poster beds have a bold presence that centers the room they are in and can be found in many styles from traditional to contemporary. 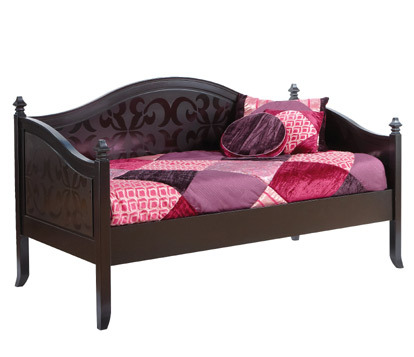 With the graceful curves of an old fashioned snow riding sleigh, sleigh beds were once known as French beds. 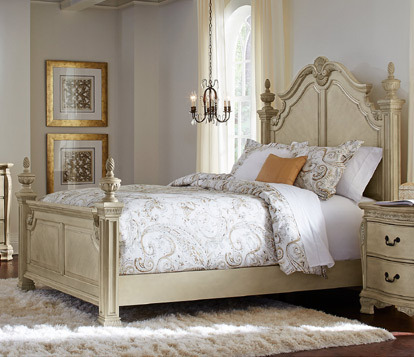 They feature scrolled headboards crafted from rich wood or metal traditionally with footboards to match. 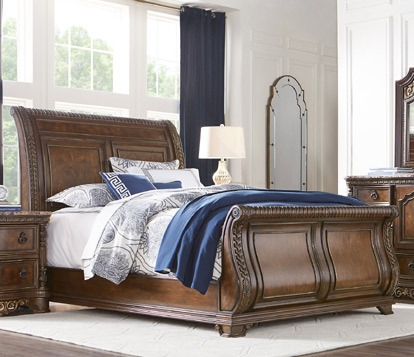 Today the curved footboard is optional and you’ll find sleigh headboards paired with straight footboard or no footboard at all. 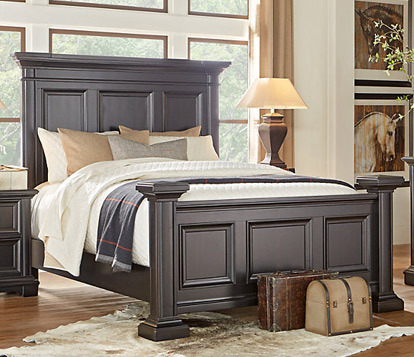 Whether ornately embellished or streamlined to emphasize its shapely curves, sleigh beds command attention in any room. Pro tip: Because of the curves this bed will end up longer than others styles, be sure you have the floor space to accommodate! 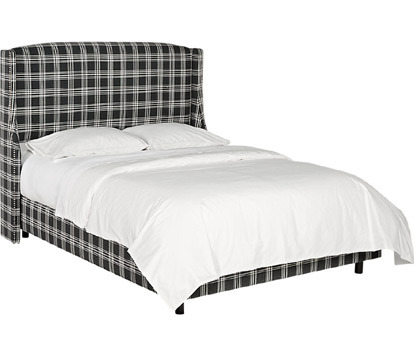 Featuring a low profile, platform beds are designed to be used with just a mattress. They typically have a row of flexible wooden slats in the frame to support the mattress without a box spring resulting in a clean and contemporary look. The mattress height on a platform bed is usually lower than a standard bed and they featuring a prominent frame with no footboard, creating a dramatic look in your room. To heighten the impact, you’ll want to showcase the frame of the bed and pass on using a bed skirt with your linens. 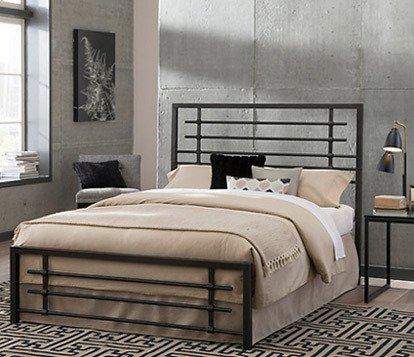 You can find platform beds in a wide range of styles, colors and finishes, but most frequently modern, contemporary or rustic; even those with classic or traditional features have an updated look. 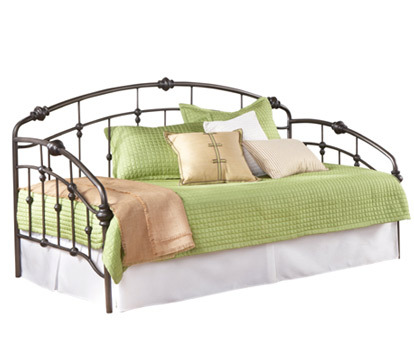 Wrought iron or powder coated steel, metal beds often offer a nostalgic aesthetic to your space. Because of their slim build they typically offer a narrow silhouette, taking up slightly less space than other choices while at the same time offering an airy, ethereal feel. 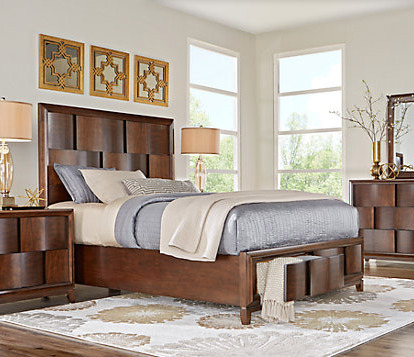 Modern or traditional, these beds offer the added advantage of introducing a contrasting material to your space that can complement your wood storage pieces beautifully. 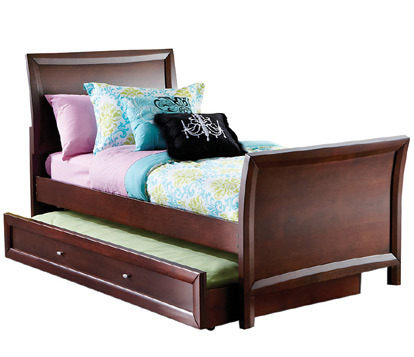 Slat beds refer to the slatted style of the headboard and/or footboard on a bed. 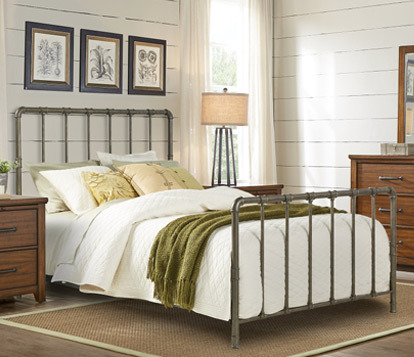 Rather than the solid composition of most beds, these beds have an open look with separated vertical or horizontal wood slats or metal bars often set into a frame. 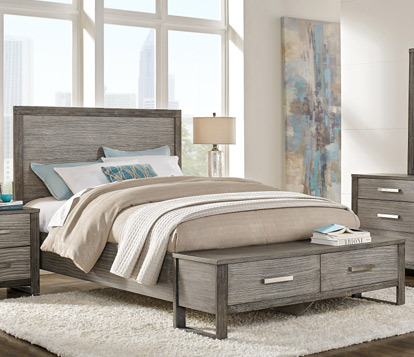 Slat beds offer personality and grace and can be traditional, Mission style, contemporary, rustic or modern. Offering a linear sense of order they have a lighter, airier presence than their full wood or upholstered counterparts. Whether fully covered in fabric or simply featuring a leather covered inset panel, upholstered beds complement and accent your wooden furniture rather than matching it. They offer a wonderful opportunity to bring contrasting colors and textures into your space. 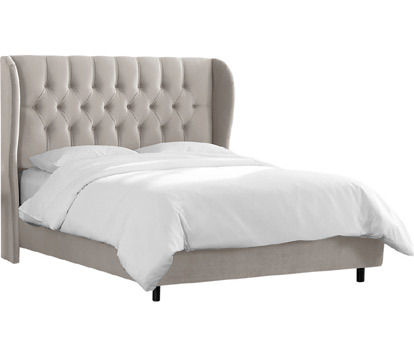 Typically padded, upholstered beds offer a soft look and feel creating stand-out style. Offering extra space to stow linens, sweaters or shoes, storage beds couldn’t be more convenient. 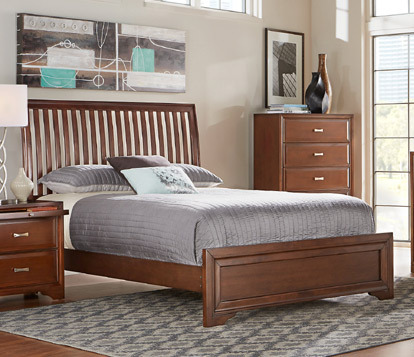 Whether drawers are built into the headboard, side rails, footboard or added to the foot of the bed mimicking a bench or trunk these beds help you make the most of your space and are available in every imaginable decorating style. 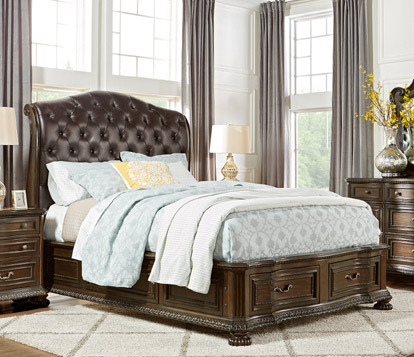 Like a classic wingback chair these beds add a stately and refined quality to your room. Wingback beds have a distinctive shape that wraps slightly around the head of the frame creating a cozy, inviting look. Typically upholstered in fabric or leather they can feature patterns or tufting for added interest. This classic silhouette can work well in traditional and contemporary spaces alike. 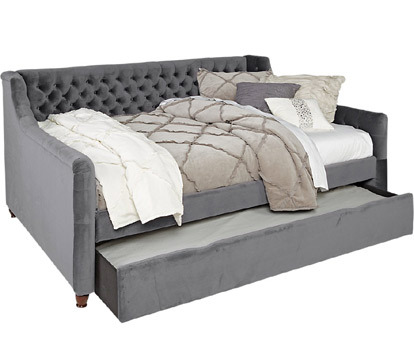 Daybeds have a sideboard serving as a sofa back and sofa arms at the head and foot of the bed. Available in twin-sized only they offer both sofa-type seating by day and a spot to sleep at night, making a handy addition to any home. Some teens prefer a daybed to a traditional bed in their bedroom because it can make their room feel more like a hang-out spot. Some daybeds house a trundle beneath the mattress and frame to store a second guest mattress. 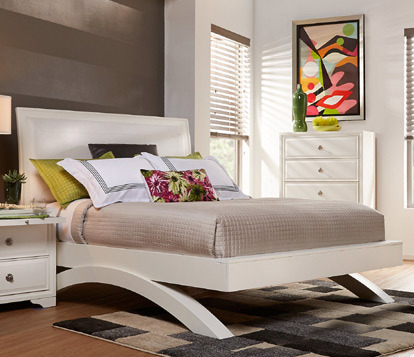 Mixing bed types is common, for instance in the two examples above – an upholstered sleigh bed with storage and a poster bed with panels. 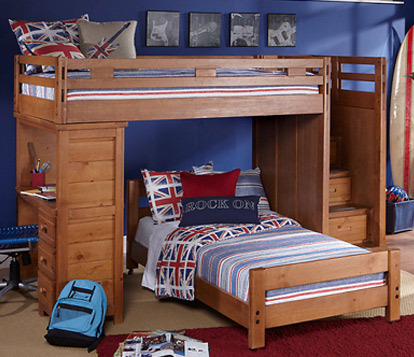 A great way to save space in a shared bedroom,bunk beds have had a long tradition in kids rooms. Today’s bunk beds are available in wood or metal in every style from traditional to modern. When shopping you’ll notice twin over twin, full over full or twin over full configurations. To make the most of tight quarters keep an eye out for upgraded features like built in desks, drawers, shelves and storage steps. 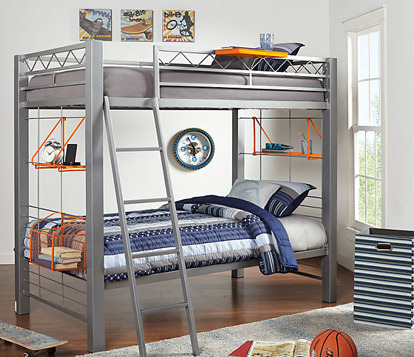 Loft beds allow you to open up more floor space in your child’s room. 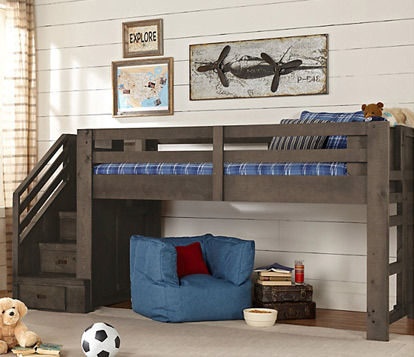 Junior lofts (sometimes called captain’s beds) are ideal for younger children as they are much lower than a standard loft but still leave room for a dresser for storage or cozy seat to create a reading nook. 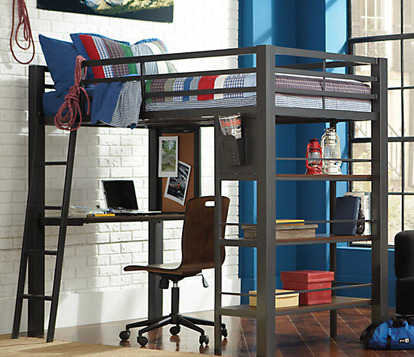 Full lofts create space for play, a homework station, a futon, storage or whatever suits your needs. Available in wood finishes or metal construction, these space extending pieces are popular with parents and kids alike. A trundle is a roll out bed in a drawer shaped frame that is low to the ground and stored under a standard bed. Typically a trundle will fit a standard twin sized mattress affording space when needed for an overnight guest, or to save space in a compact kid’s room.